Brisbane based Utilitas is a specialist biogas energy developer working to become a next generation utility. The company scopes, designs and delivers process plants for both solid organic wastes and wastewater. The company was established in 2010 by Ms Fiona Waterhouse, founding shareholder and director. Ms Waterhouse remains a major shareholder in Utilitas and continues as its Chief Executive Officer. Utilitas has its own Biomethane Potential (BMP) Testing Facility (co-located in conjunction with Griffith University). The equipment, method statements, training, research data base and template reports allow Utilitas to determine the energy potential of organic substrates to assess project feasibility, inform design and equipment specifications, to assist the commissioning process, manage ongoing plant health and to trouble shoot digestion issues. The Federal Government’s Clean Energy Finance Corporation (CEFC) puts the investment opportunity in this sector to be between $3.5 billion to $5 billion by 20201. With only 0.9 per cent of Australia’s electricity output currently being deployed from this sector compared to that of 2.4 percent average by OECD countries, the opportunity exists for Utilitas to further develop this market. Australia’s bioenergy and energy from waste market is currently under-developed but has considerable potential: which makes the investment very attractive to the Company. 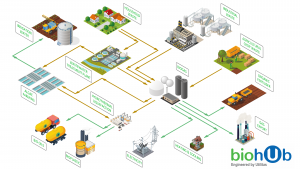 Opportunities in the bioenergy and energy from waste sectors vary in scale from small scale anaerobic digesters to large bio-mass fired power plants. With over 8,000 biogas plants established in Germany producing 4 GW of installed capacity and supplying more than 8 million households with clean, renewable “organic” energy each year2, Utilitas sees the opportunity to develop Australia’s market which has currently upwards of 50 biogas plants3. Biogas (mostly methane) is produced from organic waste including effluents, agricultural and processing residuals to produce an odourless, carbon neutral, renewable methane-rich gas that can be used to generate electricity and heat. Biogas can also be directly used to displace other fuels in boilers and burners or “upgraded” for natural gas grid injection (Biomethane); liquefied at low temperatures (BioLNG) or compressed at high temperatures (Bio-CNG) for transport fuels. Utilitas’ biogas plants safely and reliably capture and utilise energy and nutrient from this organic waste that would otherwise typically be disposed of to the environment at a cost.